Manchester United manager Jose Mourinho is reportedly likely to make the big decision to bench Romelu Lukaku for the game against Everton this afternoon. The Red Devils are back in Premier League action today after a midweek loss in the Champions League to Juventus. 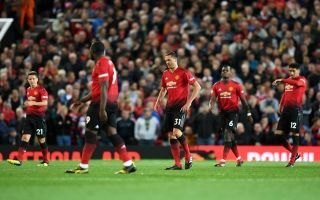 Lukaku was one of the players who looked badly off the pace in that game, and ESPN reporter Rob Dawson claims it’s likely the Belgium international will sat the game at Old Trafford out. Tweeting from his personal account, Dawson claims Lukaku is low on confidence, and many would argue he’s also looked low on general fitness and sharpness for some time now. Chance of a couple of changes to the United team today. Possibility of Valencia and Fred coming back in with Lukaku on the bench. Despite what Mourinho said yesterday, think there’s a good chance Lukaku won’t start against Everton tomorrow. Short of confidence and others deserve a go. The 25-year-old has now gone eight games without scoring for his club, and Mourinho has recently shown he’s not afraid to drop big names if they’re not performing. Alexis Sanchez learned that recently as he was left out of the United squad at West Ham, and it would be no surprise at all if Lukaku has now also used up his manager’s patience. Mourinho suggested earlier this week that he was well aware that Lukaku’s recent form has not been up to scratch in basically any department, though he was also full of praise for his attitude and suggested he believed his form would soon return. ‘A complete understanding that the player is a fantastic professional that wants to give everything,’ the Portuguese was quoted by BBC Sport. ‘Not just with the goals he is not scoring but also in his confidence, in his movement, his touch. He is not linking the game well with the team. ‘But he is our striker and he a is a good striker we believe in. Could I play Rashford there? But then I don’t have a winger as in this moment we have a difficult situation.